It has never been easier and faster to remove virtually any kind of surface coating after water and moisture damages, etc. Traditional tools like piston hammers and chisel hammers are heavy and strain the body through poor posture and bad working motion. Moreover, these tools are not suitable for larger applications where time and efficiency are critical to your competitiveness and profitability. The VOGT Hammer is simply a brilliant German high quality pneumatic tool, which sets new standards through optimal working posture. Furthermore, you will now guaranteed be able to finish your jobs 2-4 times faster than with any other tools you have ever used. With a VOGT Hammer in your equipment you can work much faster and more efficiently and make your job a real pleasure. NAC provides full satisfaction guarantee on this unique tool. Pneumatic hammers have existed for a long time, yet VOGT Hammers are different. The light, lance-shaped design gives you ideal working conditions. The practical solid construction, high-qualiy material, work-manship and durability of tools makes VOGT hammer suitable for many demanding applications. 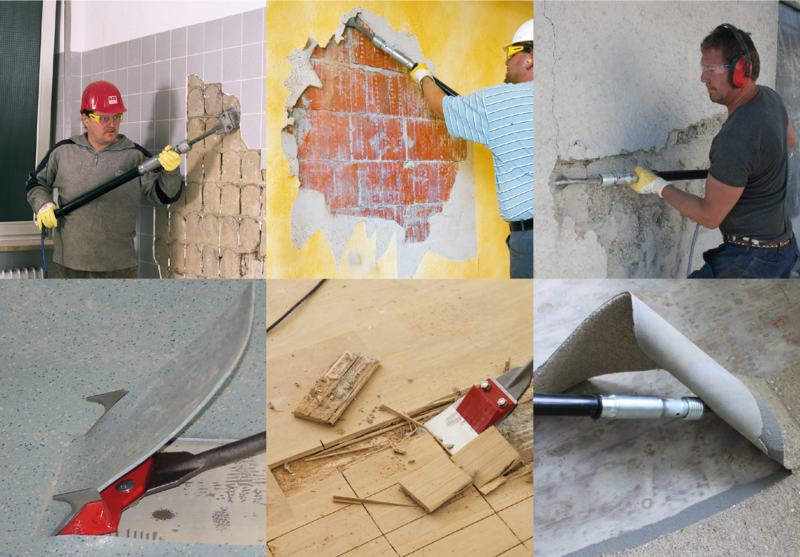 A huge range of tools and the ability to easily switch between different hammer sizes opens a unique range of applications. Therefore, the Vogt hammer is a very popular product among artisans in many different industries including the damage restoration industry. • Peeling and cutting of glued flooring. • Removal of thick layers of paint, filler, foam backings and adhesives. • Scraping of bitumen and rubber surfaces. • Removal of parquet glued with elastic parquet glue. • Removal of ceramic floor and wall tiles. • Removal of thin layers of cement and plaster. • Removal of rough spots from newly poured concrete. • Remove all kinds of coatings 2-4 times faster than with other tools. • Easy handling due to low weight and shape. • Different shaft lengths for jobs on floors and walls. • Perfect ergonomics – Optimal working posture – Protects the body. • Jobs performed faster = higher profits. • Wide range of tools. • Quick and easy tool changes. • Modest air consumption - can be operated with 230V compressor.